The Jacksonville Jaguars went into Heinz Field and knocked of the second-seeded Pittsburgh Steelers 45-42. The Jaguars needed an entire team effort and did not turn the ball over in Pittsburgh. QB Blake Bortles was 14-of-26 for 214 yards and a he threw a play action touchdown pass to FB Tommy Bohanon late in the fourth quarter to extend the Jaguars’ lead to 14. RB Leonard Fournette was efficient on the ground, gaining 109 yards on 25 carries, scoring three times. RB T.J. Yeldon led the team with 57 receiving yards. RB Le’Veon Bell was effective both on the ground and through the air, compiling 155 combined rushing and receiving yards and recording two total touchdowns. WR Antonio Brown led the team in receiving yards (132) and receiving touchdowns (two). QB Ben Roethlisberger was 37-of-58 for 469 yards and he threw five touchdowns and one interception. He also fumbled the ball when he was sacked by edge defender Yannick Ngakoue and the ball was returned for a touchdown by LB Telvin Smith, a pivotal moment in a seesaw game. With the offensive line playing so well and the defense able to make big plays, what the Jaguars needed from Blake Bortles was for him to play a clean game. They didn’t need many big-time throws (there was just one), but crucially there were no turnover-worthy throws from Bortles and ultimately that is a huge reason why the Jaguars are in the AFC Championship game. Bortles only completed three passes further than 10 yards in the air but that was not the road that Jacksonville needed to travel on to win. Instead he relied on his legs, his pass protection buying him lots of time (pressured on just eight of 28 dropbacks), and some good work on third-and-manageables to lead the Jaguars to the upset win. If the Jaguars wanted to send a message on the opening drive, they were very successful. Linder was at the heart of it, demolishing DI L.T. Walton on double teams to create big lanes for Leonard Fournette. 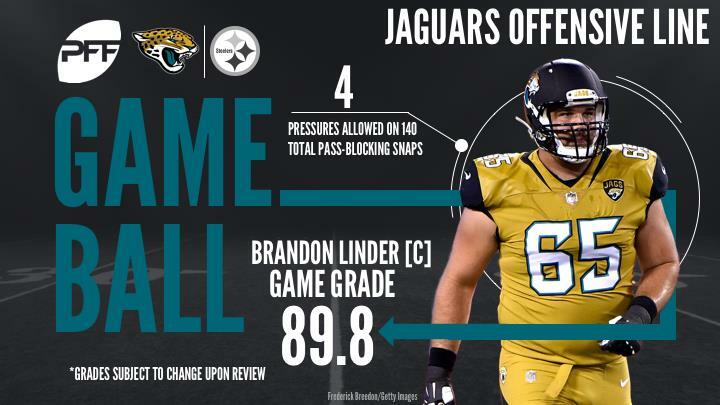 While Linder gets the highlighted name, the truth is all of the Jaguars offensive linemen should take a bow. They created, especially in the first half, a lot of room in the run game and in pass protection the five starters only allowed a combined four hurries on 140 total pass-blocking snaps. A stunning day for a unit that were simply not expected to play so well. Smith’s boundless energy netted him a scoop-and-score on Ben Roethlisberger’s fumble late in the second quarter that gave the Jaguars the cushion that they maintained throughout the second half. He also racked up six stops for the fourth time this season, which means he has now matched his career high of 62 defensive stops in a season, a mark he set last year. It was a busy day on defense for Jackson, who made plays all over the field. He had six pressures as a pass-rusher and three run stops, as well as plenty of other disruption in the run game. He even added a tackle in the passing game late in the game, dragging Brown down in bounds to further add to the Steelers’ problematic time management on their final drive. Jackson’s pressures were his most since Week 15 and his stop total was his most since Week 16. Ben had 469 passing yards, five touchdowns, and some huge plays on fourth downs to bring the Steelers back from a big early deficit but he cannot escape some of the blame for the deficit the Steelers found themselves in. His early interception to Myles Jack was followed up by a dangerous throw on the move that nearly went to Paul Posluszny, all before he surrendered a fumble on a sack which Telvin Smith returned for a score. Roethlisberger finished the season with 24 turnover-worthy plays, seven of those came in the two defeats to the Jaguars. It wasn’t during a win, but Brown had big game, with over 100 receiving yards and two huge touchdowns that beat tight coverage from A.J. Bouye. The first saw Brown reach into Bouye’s leverage to get the Steelers going after their slow start. His second score saw him beat Bouye off the line and hold off very close attention to bring the game back within a score with under 10 minutes to go in the fourth quarter. Brown caught passes against four different Jaguars but was unable to pull the Steelers all the way out of the hole they dug for themselves. While the ball seemed to follow Artie Burns around (with both good and bad returns for the Steelers), it was Joe Haden who stood out for his consistent play. Bortles stayed away from the former first-round pick, and his two attempts into Haden’s coverage resulted in zero completions and one pass break up. With some good work in the run game, Haden capped off an unspectacular first year in Pittsburgh with one of his best performances. Bursting out with a career year, a lot was expected of Heyward if the Steelers were to make a postseason run. Unfortunately it didn’t play out for him, and while he didn’t have a bad game, he was unable to make the kind of plays we’ve become accustomed to seeing out of him. With just two quarterback hurries all day and no stops in the run game, the Jaguars managed to limit the impact of the best player on the Steelers’ defense.